The Municipality of Torres Vedras, Portugal bought this huge artwork (5 meters high) of worldwide renowned Portuguese artist Joana Vasconcelos. She is known for her enormous artwork... everything is in large-scale size. She has the ability to amplify ordinary objects and make astonishing art with them. This demijohn is made of wrought iron and has planted inside some grape vines. Torres Vedras is a winemaking region, so a demijohn was a perfect choice as a local symbol of regional identity. 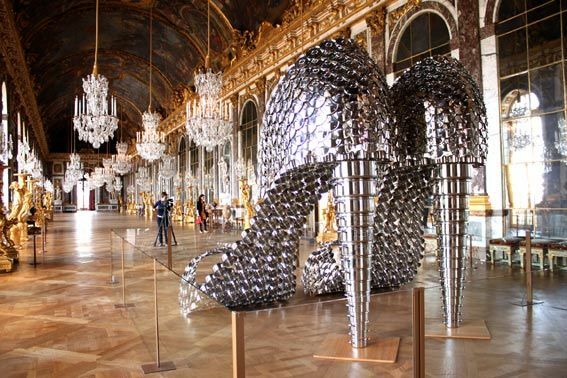 I think maybe her artwork made of hundreds of Stainless Steel Pans and Lids Shoes called Marylin, is one of her most famous works. She was inspired by the high-heel shoes worn by Marylin Monroe. KimJohnson › Love these patterns. Truly a great work of art. Love these patterns. Truly a great work of art.